BAD’s opening home bout of the #20SkateTeen season pitted the Berkeley Resistance against the San Francisco ShEvil Dead in a hard-hitting test of endurance and stability, resulting in victory for the zombies, 172-99. BAD’s teams took the track at San Francisco’s historic Palace of the Fine Arts under the gaze of two ominous angel statues and a triumphant crowd of about 700 fans. 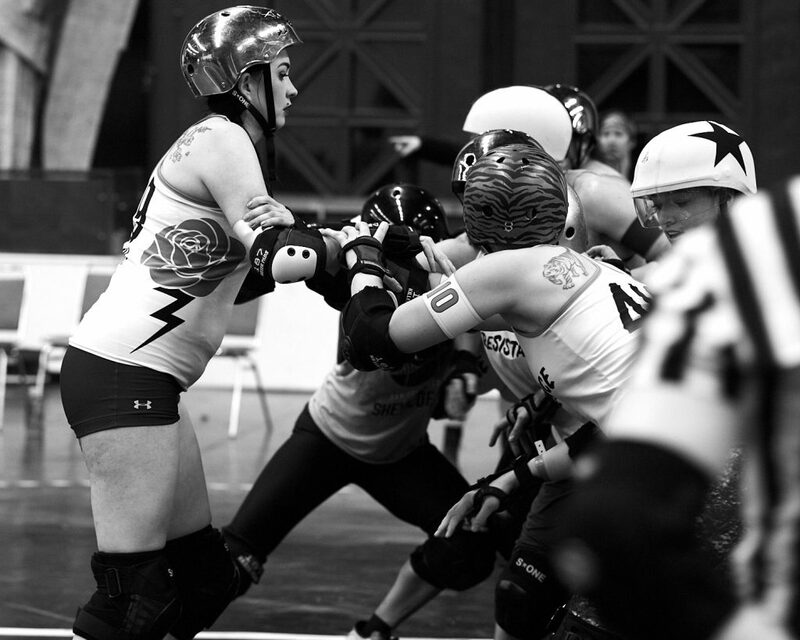 The starting jammers–Eva Menace for the Resistance and Danymite for the ShEvil Dead–crashed into the pack of skaters, with Dani taking a quick lead and forcing Eva to pass the star to her pivot, Raven Evergore, while Dani continued on to score five points and call off the jam. The first half of play saw the teams trading low-scoring passes and calling off the jam. It seemed as though both teams were working more towards stability on the slick track than on elaborate strategy. Both teams used up their official reviews in the first half of play, requesting the officials to call cut track penalties on the opposing team’s jammers. The officials stood by their decision in both cases, and both teams lost their official reviews. At halftime, ShEvil led the Resistance with a score of 89-45. The Resistance came back swinging, however, taking on a two-wall of ShEvil blockers and scoring a quick five points. The next jam, too, saw Berkeley’s Smother Mary break through a full contingent of zombie blockers, leading to yet another star pass from ShEvil’s Sterling Archer to pivot Stefanie Mainey. Berkeley’s momentum was not to last, even as the Resistance and ShEvil both solidified their defensive strategies in the second half of the game. With just over ten minutes left on the clock, Berkeley completed a star pass right off the line to Raven Evergore. 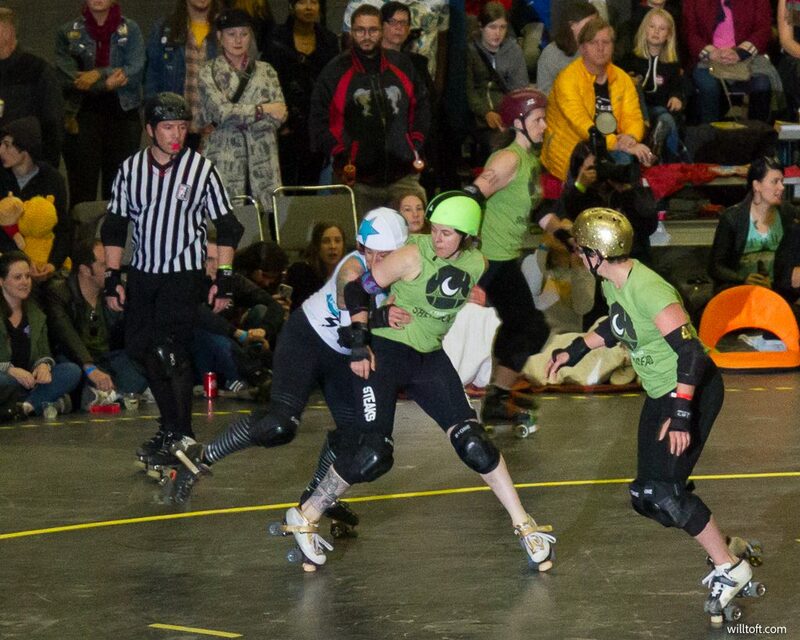 But ShEvil’s jammer, Tifa Knoxhard, followed closely behind out of the pack and into her scoring pass. After two passes the ShEvil blockers were able to clear the penalty box and, with Stefanie Mainey bracing a wall of three, shut down Raven Evergore and allow Tifa Knoxhard the time to break through the Resistance tripod, all while running down the game clock. From then on, the half saw multiple scoreless jams, including one with only 8 minutes left on the clock, where the tripod walls for both teams held the jammers for a full two minutes–a testament to both teams’ strength and communication. At the end of the night, the ShEvil Dead emerged victorious, with a score of 172-99. The Resistance have another chance to prove themselves in their upcoming fight for the East Bay against the Oakland Outlaws on April 7th, again at the Palace of the Fine Arts. Which team will own the Bay? Featured image by Mark Nockleby.